WHAT HAPPENED: The brand-new Louis Armstrong Stadium doomed a third Grand Slam champion in just four days Thursday night when Lesia Tsurenko took down No. 2 seed and Australian Open champ Caroline Wozniacki, 6-4, 6-2. Reigning French Open champion Simona Halep lost there Monday, and two-time major winner Garbine Muguruza went down Wednesday night. 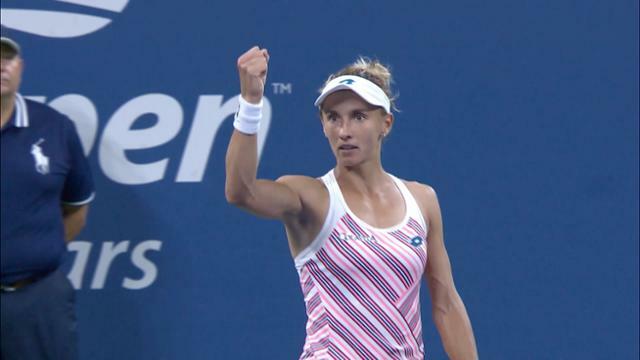 Tsurenko, 29, scored the biggest win of her career with the upset, although she also scored a major upset in Cincinnati two weeks ago by taking out the defending champ, Muguruza. Under the New York lights, Tsurenko took over after trailing Wozniacki 1-3, winning 11 of the next 14 games by playing with more energy and aggression than the two-time US Open finalist. Wozniacki’s trademark consistency was not there, and Tsurenko’s bold play from the baseline helped her win the majority of the rallies over nine shots, usually Wozniacki’s bread and butter. Tsurenko threw in more unforced errors than Wozniacki – 38 to 35 – but also 20 winners to her opponent’s six. At times, the rallies were beautiful displays of shotmaking, but Tsurenko came up with more clean winners, and Wozniacki struggled to wear down her opponent. She felt like she had chances. "I saw balls I felt like I could finish, like I could hit big on,” she said. “But she played well. Got a lot of balls back. Waited for the short ball and played a lot of angles." Once Tsurenko had a one-set lead, she began playing free-flowing tennis, smoothly moving in and finishing points mid-court with sure forehand winners. Wozniacki began to surrender after giving up a break to go down 2-4. On game point, Wozniacki tossed in a double fault. Two points later, she had another chance to get to 3-4, and the crowd roared its support for the favorite for the first time in the match. But Wozniacki erased her advantage point with an unforced error and minutes later bowed out of the tournament. "I was not nervous," Tsurenko said in her post-match interview on the court. “I was feeling the atmosphere from my team and everyone who came to watch this match. I was hearing my name a lot." WHAT IT MEANS: This is the first time in the Open Era that the top two women’s seeds have gone out before the quarterfinals. Kiki Bertens, the No. 13 seed and winner in Cincinnati two weeks ago, now has a clear path the quarterfinals in Wozniacki’s section of the draw. The highest seed left in her section is No. 5 Petra Kvitova, who has never been to the quarterfinals in 10 tries at the US Open. MATCH POINT: Despite the upsets, the top of the women’s rankings are unlikely to change after the tournament. Both World No. 1 Halep and No. 2 Wozniacki defended their points from last year’s early exits. August 30, 2018 - Lesia Tsurenko in action against Caroline Wozniacki during the 2018 US Open. August 30, 2018 - Caroline Wozniacki in action against Lesia Tsurenko during the 2018 US Open. August 30, 2018 - Lesia Tsurenko takes a medical timeout during the 2018 US Open. August 30, 2018 - Lesia Tsurenko and Caroline Wozniacki meet at net during the 2018 US Open. August 30, 2018 - Lesia Tsurenko reacts to winning against Caroline Wozniacki during the 2018 US Open.